The photos shown here represent another portion of the Flodden wall, previously photographed and written about on this blog here. 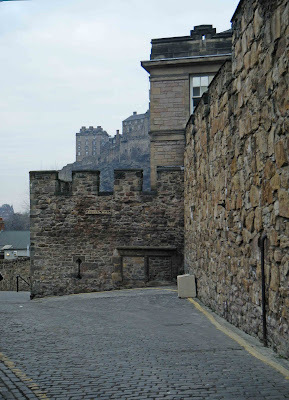 This portion of the wall, lays to the South of Edinburgh Castle, and connects directly with the smaller and more recent Telfer Wall where Brown's Place meets the Vennel at the top of the stairs. Above. A view of the Flodden Wall tower looking South, showing the bricked-up window and a single tiny embrasure. The beginning of the Flodden Wall is marked by the small tower shown above and below. This is the only surviving tower on the Flodden Wall today, and it has survived thanks to the Heriot Trust who saw fit to preserve it. Above. Another view of the tower looking South, with the Castle in the background. The tower still retains its small embrasure on the North, South and West faces. A window was opened in the South face of the tower in 1876 on the instructions of the Town Council, for what reason I don't know, but has since been bricked up. Above. A view of the tower looking North towards Heriot Place. 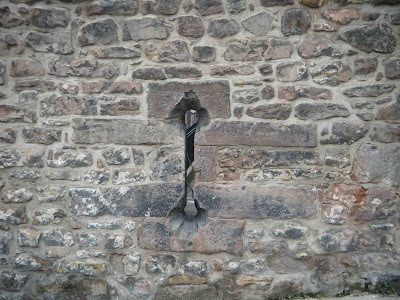 The Flodden Wall was built around 1513\1514 in reaction to an expected English attack\invasion. It was hastily built, and not particularly defensible, being less than one and a half metres thick at the bottom, thinner at the top, and generally around seven feet high. Above. An embrasure on the North face of the tower. Above. 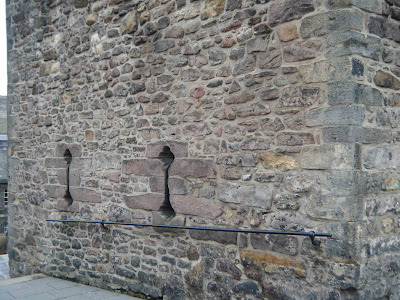 Two embrasures on the West wall of the tower. Above. The bricked-up window in the North face of the tower. Above. 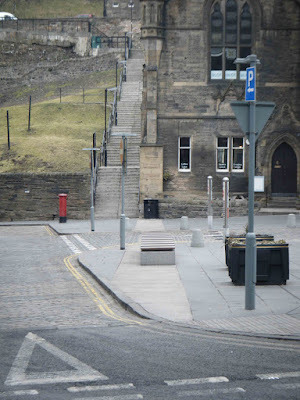 The route of the Flodden Wall across Grassmarket. Marked by the light coloured paving stones, and the pale wall to the right of the stairs. 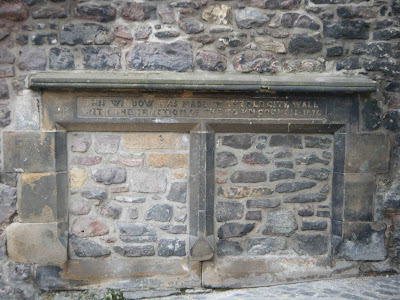 At the bottom of the Vennel, the plaque, shown below, can be found, marking the spot where the wall would have continued across Grassmarket. 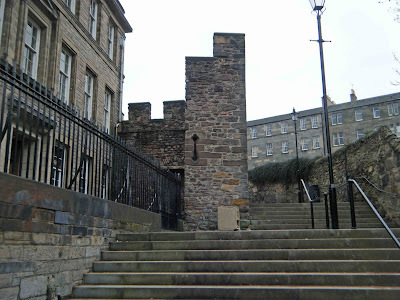 Here, somewhere between the bottom of the Vennel and the bottom of Granny's Green Steps, the West Port would have stood, one of six gateways through the Flodden Wall. Above. 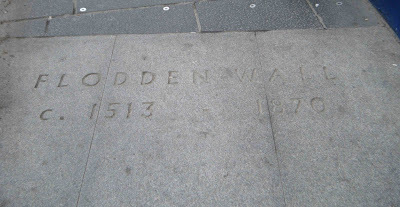 Plaque marking the route of the Flodden Wall across Grassmarket. Above. 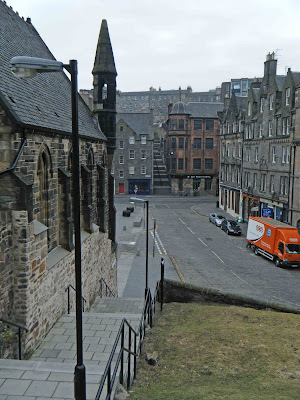 The route of the Flodden Wall looking down Granny's Green Steps towards Grassmarket and The Vennel beyond. 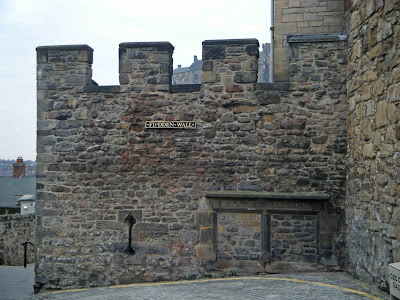 This is a great route towards the Castle Esplanade and the end of the Royal Mile.